Mariah Carey recieves a beat down on the billboard charts. 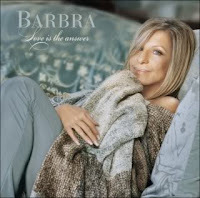 67 year old Barbra Streisand comes in at Number 1 with her release "Love Is The Answer" (180,000 copies). Mariah Carey comes in at number 3 selling only 168,000 copies. Why is Barbra Streisand number impressive and Mariah Carey's not? Well Barbra Streisand is 67 and the lastest album is a Jazz album. Mariah Carey last album debut numbers were 463,000 and sold more copies 182,000 in the second week as her current debut. Madonna comes in at number 7 with her greatest-hits compilation Celebration. I'm sure Madonna was expecting higher numbers as well but how much can no original music really sell when you have Barbra Streisand and Mariah Carey releasing new music? Comeback Diva Whitney Houston falls out of the top ten and lands at Number 13. "I Look To You" the former number 1 album which was released over a month ago is selling very well. With debut numbers of 304,000 albums! However, this album has not produced not one hit single, which will be a problem come Grammy award time.